At Herkules we believe the key driver for success is to have an active industrial ownership approach. Key drivers for the Espresso House success was a focused and clear value creation plan and a strong and seamless cooperation between Herkules and the management team. We identify the company’s value drivers and thoroughly implement a focused action plan. We are active owners with a 3 phase ownership methodology – Sourcing, Development and Exit. Herkules acquired Espresso House in September 2012 through a structured sales process. Extensive analysis and evaluations were made, focusing on understanding Espresso House’s value proposition. We defined Espresso House as a “winning concept” with a strong brand and consumer preference. The company had 117 owned shops at the time of acquisition, offering high quality specialty coffee, and a broad menu of warm and cold drinks, hot and cold food and bakery products. 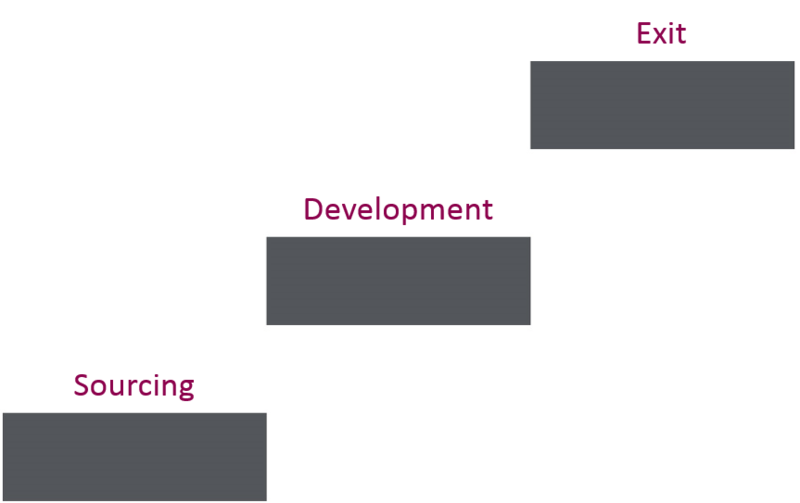 As active owners, phase 2 is the most important, where we execute on the initiatives identified in phase 1. Together with Espresso House management, we developed a detailed action plan, executed successfully, and closely monitored progress and KPIs. The key driver in the value creation plan was to accelerate revenue growth. Average revenue per unit increased from SEK 3.8 million to SEK 5.7 million and we increased the number of units from 117 to 193. LFL growth increased from 1.5% in 2012 to 4% in 2014. Management worked systematically to find and get access to the most attractive locations. A very attractive growth model was established, where all new units were financed 100% with new debt. During Herkules’ ownership, both revenues and EBITDA from the new shops radically increased and payback time was reduced. A number of attractive locations were also acquired with short payback time. A net of 57 new shops were added in Sweden, with focus on opening larger units with annual revenues above SEK 10 million. 21 of the 30 largest shops were opened between 2012 and 2015, and average revenue per new shop increased from SEK 4 million to SEK 7.5 million. In Norway, Espresso House opened its first shop in July 2013. In order to immediately reach critical mass, the company acquired 7 attractive locations from the bakery chain United Bakeries, in January 2014. The roll-out in Norway was one year ahead of plan at the time of the exit, with 19 shops. Following the successful expansion to Norway, it was decided to also expand to Finland. A country manager was hired in Q1 2015, and the first shop opened in Q3 2015. Due to strong cash flow generation, a dividend recapitalisation was carried out one year post acquisition, returning 0.2x of the cost to investors. Espresso House was established in Sweden in 1996, and was at the time of exit (30 May 2015), one of the leading branded coffee shop chains in the Nordics serving more than 60,000 customers daily through its 193 shops across Sweden and Norway. Estimated revenues for 2015 are SEK 1.2 billion. Espresso House’s EBITDA had more than doubled during Herkules’ ownership and was for 2015 estimated to be SEK 188 million, up from SEK 72 million last twelve months prior to closing in 2012. Following a strong Nordic exit market and Espresso House’s outstanding performance, Herkules received several incoming calls from interested buyers of Espresso House. In the beginning of 2015 Herkules decided to test the exit potential with a small handful of both financial and strategic international buyers. Through extensive research, Joh. A. Benckiser was identified; a privately held German group, who were to build a global leading coffee firm through acquisitions in the USA and Europe. The group focuses on long-term investments in companies with premium brands, attractive growth and strong margin dynamics in the Consumer Goods category. A commercial agreement was reached with the group in May 2015. A strong brand coupled with outstanding performance resulted in a successful exit for Herkules III with a MOIC of 5.7x and an IRR of 78%. Strong execution from management and the Herkules team implied that Espresso House performed ahead of business plan, which enabled exit 1-2 years before the original plan. The transaction was closed on 1 July 2015 and completed at an EV/EBITDA multiple higher than recent transactions in the coffee shop space and other retail transactions.